EspañolRodolfo Orellana Rengifo, the alleged head of Peru’s largest organized crime network, is considered the country’s most wanted criminal. On the run since July, his time as a fugitive came to and end on Thursday, November 13. In coordination with Peruvian authorities and the US Drug Enforcement Agency (DEA), agents from the Colombian Special Division against Organized Crime and local police captured Orellana in Cali, Colombia. According to police investigators, Rodolfo Orellana and his sister, Ludith Orellana, managed an extensive criminal network, involving lawyers, judicial officials, notaries, and both current and retired members of the police force. The group allegedly orchestrated large-scale real estate fraud and money laundering operations, and used violence and intimidation to deal with those that got in their way. Peru’s most wanted criminal, pictured here being read his rights, was captured in Cali, Colombia. According to authorities, the Orellana network committed more than US$100 million in fraud. In April, more than 25 Peruvian journalists held a press conference to denounce harassment and legal proceedings against them for investigating Orellana. In June, Peru’s anti-corruption office initiated a criminal investigation and began to look at the network’s operations in the Peruvian department of Áncash. Following months of official complaints lodged against Orellana, authorities issued a warrant for his arrest in July. The first criminal complaint against Rodolfo Orellana Rengifo came in June 2005. At the time, Orellana was a member of the Lima College of Lawyers (CAL), but was forced out due to alleged mismanagement of the organization’s budget. Orellana denied all charges. Rodolfo Orellana Rengifo is a legal gangster who, through legal maneuvering, robs people of their legitimate property. The same year, the Public Ministry of Peru initiated an investigation against Orellana on suspicion of real-estate fraud and money laundering. Giovanni Paredes, a Peruvian businessman, has been one of Orellana’s most outspoken critics. “Rodolfo Orellana Rengifo is a legal gangster who, through legal maneuvering, robs people of their legitimate property,” Paredes said in September 2011. To facilitate his criminal activity, Orellana founded an NGO called the Association of Judges United for Democracy, which was contracted to train Peruvian judicial officials. 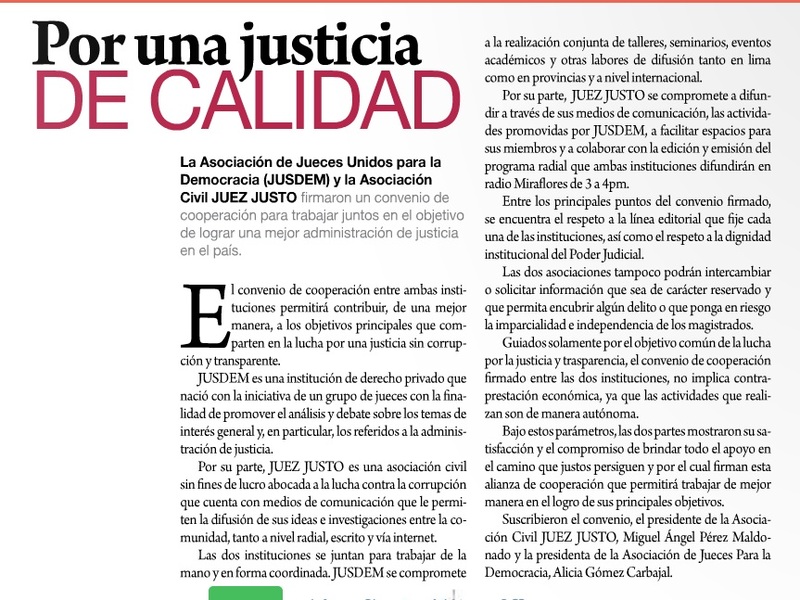 Orellana also started a magazine, Just Judge, which slandered lawyers and judges who investigated his activities, and praised legal officials that supported his work. Orellana’s network took advantage of loopholes in Peruvian arbitration legislation. The network initiated sham arbitration proceedings, where a supposedly objective arbitrator would settle a legal dispute between two parties. However, Orellana’s network would initiate proceedings behind the second party’s back. The rightful owners of the supposed disputed property would only learn of the arbitration proceedings after the judgment had been entered into public record, meaning the property would be taken from them. To ensure rulings went in his favor, Orellana enlisted a team of notaries, judges, police officers, and municipal officials. His network comprised of more than 100 individuals and organizations. The Orellana network also worked with bank officials to fabricate fraudulent loans and mortgages. Orellana and his associates manipulated a loophole in Peruvian bankruptcy law that allowed them to create false debt under stolen identities and shell companies. Orellana would then initiate foreclosure and repossession proceedings to claim the property in question. The Orellana network’s third tool for committing fraud involved financial letters issued by the Coopex cooperative. Construction companies used these letters to demonstrate their economic solvency during a contract bidding process. Once the company won the contract, and received payment in advance for the project, it would disappear. It is estimated that Orellana defrauded the Peruvian government of more than US$19 million using this tactic. Former judges, political figures, and individuals linked to drug trafficking and real-estate fraud were all on the Coopex payroll. Among these was Colonel Benedicto Jiménez, a lawyer who is currently in prison, awaiting the start of legal proceedings for his role in the Orellana network. Translated by Alex Clark-Youngblood. Edited by Guillermo Jimenez.